You can now create a Proverb station on Pandora! If you have a pandora account, login, search Proverb or A Common Man's Opus and create you station! Don't forget to tell your friends!!!!!!! Thanks to your support, 2011 has been a huge year for ya boy, thank you and Merry Christmas. It is more than official. The book that we have waited since 2001 is finally complete. 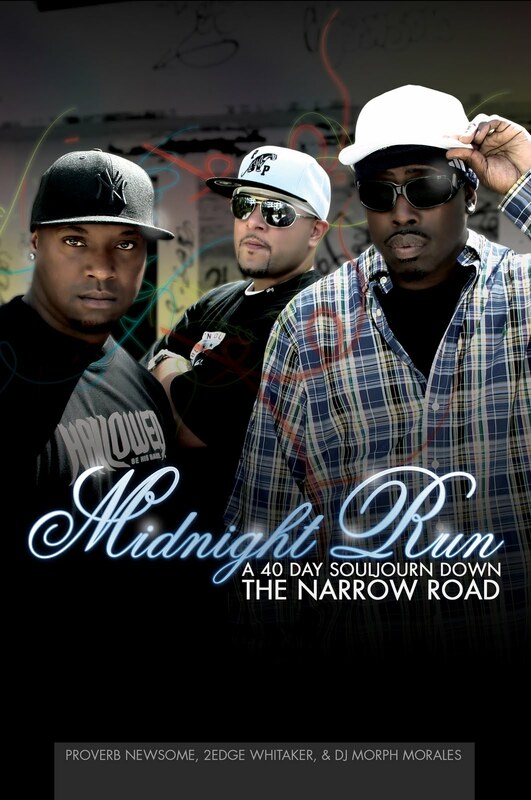 Midnight Run: A 40 Day Souljourn Down The Narrow Road is ready for the masses. It has been a long road with lots of challanges but God has allowed the day to come and it is finally here! The book will be available December 13th on our Create Space (An Amazon.com company) e-store, Amazon.com, as well as the on the 1Way members individual websites: proverbnewsome.com, 2edgemusic.com, djmorph.com It will be available on Kindle a few weeks later. You will even be able to go to your favorite bookstore and order it. How dope is that? I just wanns thank the fans & friends that have stuck it out with us for 20 plus years now! We still get emails, and hear stories about what God has done and is doing through our music (collectively and individually) in your lives. It is very encouraging and quite frankly, humbling. Thank yall for souljourning with us! I wanna thank our families as well. They have put up with a lot of pipe dreams, long nights, weekends away, rehearsals, etc. Your sacrifices made this project and every project before it possible. Thank you! We love you! We could not continue nor would we want to without our Lord, family, friends and fans! Now everyone represent on December 13th. Life As I'm Livin' It! I figured that since my last blog was me just venting about how I am not motivated enough to get some things that I really want to accomplish done that I would one, give an update on some of those things and two, tell you about my current existence. Since the last blog, I have been laser focused on the 1Way devotional book. Good news I have made some progress. I am working with a company for the cover art as well as going over each devo for editing and update purposes. We started writing this thing back in 2006. We did at one point have some interest from some very interested parties but it never worked out. The good news is that having gone thru it devo by devo the material is still fresh, the messages are still relevant. This is very promising. My goals to have it published by end of this year. Since this is now my focus, the work on new music has come to a halt. I have accquired tracks and made some great relationships with writers but I am not currently recording right now until I know this book is finito! So unless someone hits me up to feature, no new music for a while. So what exactly do I do when I am not doing music...... ministry! I work at Urban Youth Impact. It's a non-profit urban ministry here in Bomb Beach, Florida. Here I get to work with urban kids everyday showing them Christ. I guess I could if I wanted to call myself a musicianary/urban missionary. It is one of the greatest jobs I have ever had but probabaly the most challanging as well. Bad days seem to outweigh the good on most weeks but when the good weeks come, it is more than worth it! I also get to work with some really cool people from all different walks of life. Furthur stretching me as an individual. One of the cool things I get to do on a weekly basis is lead chapel. I am really enjoying that alot. I have been told often by those that have heard me speak that God has gifted me and I can see and feel that when I allow myself to. Doing these weekly chapels is helping me hone my communication skills. I'm not sure what the future holds but I bet God has something in mind. On the fam front, being a husband, and father has had it own rewards! It is so dope to watch my kids grow up knowing that we are doing the best we can to make Jesus a part of their childhood. Now before you get all weird, here is what I mean. We tend to share the things in life that are important to us with those we care about the most right? Well, Christ is a central part of our family and has been even before we had kids. It would only be right to share Him with our sons. Deuteronomy 4-9 says it like this: The Lord is our God, the Lord alone. And you must love the Lord your God with all your heart, all your soul, and all your strength. And you must commit yourselves wholeheartedly to these commands that I am giving you today. Repeat them again and again to your children. Talk about them when you are at home and when you are on the road, when you are going to bed and when you are getting up. Tie them to your hands and wear them on your forehead as reminders. Write them on the doorposts of your house and on your gates. This is what we are doing. Well, not tying anything on there heads but you get the point. We are passing life down. Spiritual, generational information that is going to enrich them as they grow to appreciate whose they are, where they come from and where they are headed. I asked my son Micah recently how I was doing as a dad. He said " Your doing a great job dad. You love us and you work hard." in his simple statement I find comfort and success even if I don't think I'm as successful as I should be. New Single ClichÃ©s Now Available!! Hey, hopefully your still here. It has been 3 yrs since the release of A Common Man's Opus, and only one song since. Now I know what your thinking....... well maybe I don't but I haven't just been sitting on my hands I assure you. In my last post here I talked about my family and how I was spending time with my wife and boys. Music is always in my heart, but unfortunately took a back seat for a while, which is not necessarily a bad thing. Recently I got an opportunity to be on another Rapfest Presents project. If you remember I had a song called " Let's Ride ft. Raj" on Rapfest Presents Vol. 2. On Volume 3 there will be a song called "Clichés". I really hope you listen , like and download it! The song has a first for me, but I won't give away too much, you'll have to hear it. My man Edge is on the project too. Look for his song "Love is Like". So obviously I AM STILL DOING MUSIC!!! Lol. I'm still booking dates and would love to come to your spot. Hit me up and let's work that out . The song and the project are due to drop next month. I'll keep ya posted and hit ya with a link as soon as I get it. I'm working with a new team of producers, writers, and musicians for the next project. Right now there is no official release date but things are headed in the right direction. Thanks for your prayers, support, love and comments. In other news, I may be getting back into radio!!!! Well, at least internet radio. Details are still being worked out so I will keep ya posted on that too. I love you all! Hit up the guestbook when you can, I would love to hear from you again. Man, it seems like forever since I had some new music related news to bring you. Truth is I still don't have any. LOL. I am gonna be at Crossover in Tampa at the end of the month. Looking forward to that. I have been writing new songs, and putting together concepts for my next project. Be prayerful with me on that. It is a very unique and humbling process to relate Christ and life in poetry form, at least it is for me. Thanks for rollin with a brova!